Celebrate a February Birthday with a beautiful piece of hand-crafted Fine Jewellery by the talented Goldsmith Julian Stephens. Julian’s wealth of gemstone knowledge and decades of experience setting precious stones, creating unique and memorable designs have produced a wonderful ready-to-buy collection of stunning Amethyst jewellery. 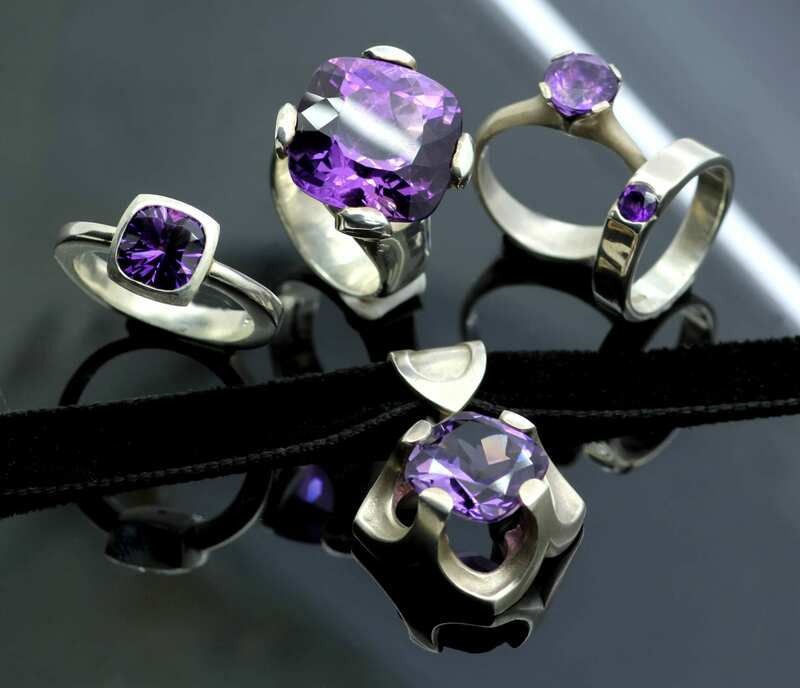 Stunning statement jewellery, handmade by Julian Stephens and featuring a glittering array of Amethyst gemstones. Highlights from Julian’s current collection include some Gothic inspired statement pieces like the gorgeous Abbey choker pendant. Julian Stephens contemporary take on Gothic culture is perfectly captured in his Amethyst Snake ring presenting a bold and glorious Amethyst stone surrounded by intricately textured snakes to create a mesmerising statement ring. In addition Julian Stephens is renowned for his bespoke pieces, designed and made in-house to your specific requirements, personal style or budget. Julian has a wonderful collection of ethically sourced Amethyst stones available in a glorious range of cuts (as pictured in some of our beautiful imagery) with varying hues from soft lilac to a deep, intense purple. 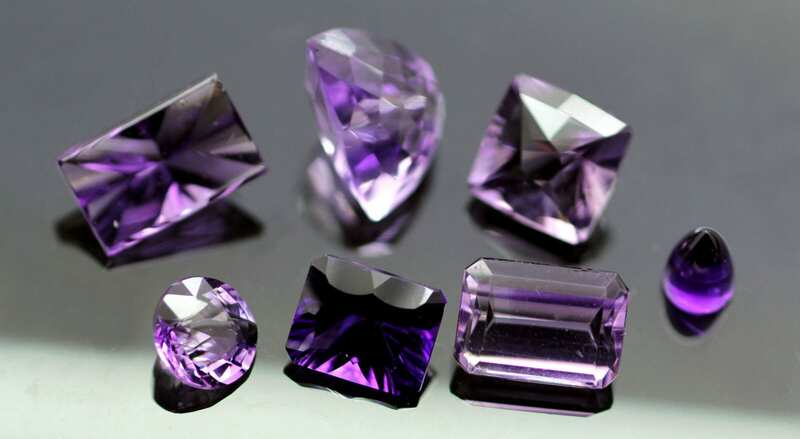 Amethyst is a purple variety of quartz (SiO2) and owes its violet colour to irradiation, iron impurities (in some cases in conjunction with transition element impurities), and the presence of trace elements, which result in complex crystal lattice substitutions. Amethyst occurs in primary hues from a light pinkish violet to a deep purple. Amethyst may exhibit one or both secondary hues, red and blue. The purple Quartz stone Amethyst is mined in Brazil, Uruguay, Sri Lanka, Siberia, Canada, India, Bolivia, South Korea, Argentina and the U.S.A. Until the 19th Century Amethyst was considered a Cardinal Gem (one of the five most precious and rarest of stones) until large volumes of Purple Quartz were discovered, providing an abundant source of large geodes in Brazilian volcanic rock. February’s Birthstone is the Amethyst gem. Learn all about gemstones and the Amethyst in our new blog exploring the science and lore of geminology. The name “Amethyst” was coined by Ancient Greek mythology; translated as “not drunken” and linked to the popular myth that Amethyst stones were a powerful antidote to drunkenness. This concept was taken a step further in the mid-1500s when a French poet Remy Belleau invented a fable to further embellish this idea. In Remy Belleau’s tale Bacchus, the god of intoxication, wine and grapes was pursuing a maiden named Amethyste, who refused his affections. Amethyste prayed to the gods to remain chaste, a prayer which the chaste goddess Diana answered, transforming her into a white stone. Humbled by Amethyste’s desire to remain chaste, Bacchus poured wine over the stone as an offering, dyeing the crystals purple. – In Medieval Western culture the Amethyst was considered as having healing and protective properties and was often incorporated into jewellery design of this period as protective amulets or brooches, typically worn by soldiers heading to the battlefields.- During the Middle Ages the Amethyst was considered one of the Cardinal gems; one of five gemstones considered precious above all others (due to its rarity during this period of History.) Intricately carved Amethyst stones were once popular amongst Cardinals and the clergy and the Crusaders attached Amethyst stones to their rosaries. – In the Egyptian book of the dead, instructions are given for placing heart shaped amethysts on the body of the deceased. This use of the heart -shaped crystal survives today in the practice of the groom giving a heart-shaped amethyst that is set in silver or gold to his bride.- In Tibet Amethysts are considered as sacred to Buddha and used to create prayer beads.- Amethysts are historically throughout English culture to adorn and celebrate Regalia with stunning examples of Amethysts adorning some of the Finest Jewellery custom made by the most skilled artisans to produce some astounding Royal ceremonial artefacts.